Clair now offers GPR services for concrete scanning. With this cutting-edge technology we can provide a real time view of the interior of concrete structures. We are able to generate images for direct on-site evaluation of scan data by the operator. 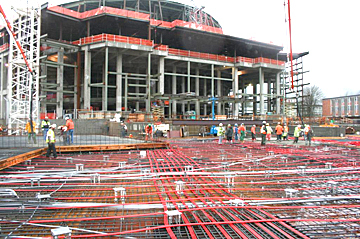 This advanced technology allows us to locate rebar, tensioning cables, metal and plastic conduits, glass-fiber cables, voids and wood in dry concrete structures. Concrete scanning can be performed on floors, decks, slabs, balconies, etc. in structures such as tunnels, bridges and buildings. The information gathered with this technology minimizes the possibility of hitting concealed objects when drilling anchor holes or through holes, breaking out openings and in diamond coring and sawing work. All scanned areas can be reported in both 2-D and 3-D data visualization with top view and cross sectional views allowing for detailed assessments.